When I read this weekend that Tony Hillerman passed away, it made me curious to know about the perception of him in the indigenous community. 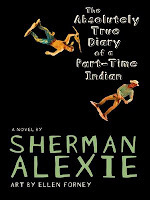 Throwing caution to the wind, I looked to one of my favorite writers (to read & teach) Sherman Alexie. "Tony Hillerman's work [mystery novels set around reservations] should be classified as what it is - colonial literature... I think there's an arrogance amongst white Americans about their relationship to the oppressed people that prevents them from seeing themselves as coming from a position of privilege." Have you read the book? It's fantastic. I actually listened to it on my mp3 player, and he reads it. It's a mystery to me how his writing always manages to be so funny and so achingly sad at the same time.